What Do We Want from Dark Souls II: Scholar of the First Sin? Do-overs are rare in the world of video games. Will FromSoftware make the most of theirs? 2015 is shaping up to be a very good year for FromSoftware fans. Flash back to 2012: It seemed downright miraculous when the original Dark Souls saw the Artorias of the Abyss DLC, which, despite its reliance on established environments, made for one of the best chunks of content in the game. And, regardless of its many (many) technical issues, Dark Souls' PC port came as a welcome surprise, and did wonders for the community by expanding the series' reach outside of the console realm. In 2015, we're not even 12 months removed from the sequel's original release, and we've already seen an extremely well-done Dark Souls II PC adaptation—which has, unsurprisingly, become the definitive version—and three ambitious DLC installments, with each offering experiences not found within the core game—not to mention some of the hardest bosses the series has ever seen (I'm looking at you, Fume Knight). So, if you're a FromSoftware fan, it's safe to say you've been incredibly spoiled by a series that first entered this world as a PlayStation 3-exclusive oddity (and one that barely made it to America in the first place). This April, From will up the spoilage factor with their Scholar of the First Sin update/port, though the release has some complications. All previously existing copies of Dark Souls II will receive a free patch which adds new NPCs, changes specific item descriptions, rebalances certain elements of the game, and improves online matchmaking. If you want to take advantage of First Sin's biggest improvements, though, you'll have to invest in a brand-new copy of the game—even if you own the PC port. On the PlayStation 4, Xbox One, and PC (in an improved DirectX 11 form), Scholar of the First Sin acts as a "special edition" of sorts, including all of the aforementioned changes, the three released DLC chapters, as well as an improved presentation, and an increase in maximum co-op partners from the original version's two to five. If you've never touched Dark Souls II before, Scholar of the First Sin makes for an incredible package; even if Bandai-Namco releases it at a standard retail price, that's still a lot of game for your dollar—and a great one at that. And if Scholar of the First Sin on PlayStation 4 and Xbox One ends up looking and performing as great as the PC port of the original DSII, it'll be a must-have upgrade for those who originally played it on PS3 or 360. It can't be overstated how much these improvements make the Dark Souls experience even better, especially in terms of loading times—in a game where you die a lot, it's much less frustrating to wait a few seconds between respawns instead of 30. And once you see the world of Drangleic portrayed in the splendor of 60 frames per second, it's impossible to go back. Of course, if you've already invested hundreds of hours into Dark Souls II, the most exciting changes to Scholar of the First Sin come in the form of new NPCs and revised item descriptions—a seemingly trivial addition in any other game, but vital to understanding more of FromSoftware's cryptic fantasy worlds. Even if you refuse to take part in the pointless Internet bickering about which Dark Souls game reigns supreme, there's no denying part two comes up a little short in terms of storytelling. The setting of Drangleic still provides plenty of mysteries, but also a lot of missed opportunities—by the end of the final DLC, it seemed From had more invested in raising new questions rather than providing vague answers to the ones already established. The original Dark Souls' greatest moments could be found in its NPC questlines, so I'm hoping these new characters won't exist in a vacuum and assist in revealing more about the established cast. Frankly, I'd be up for a full DLC that explains what the hell's up with Benhart. To find out what the Souls community thinks of Scholar of the First Sin, I reached out to Gary Butterfield and Kole Ross, who run the Souls-focused weekly podcast Bonfireside Chat (and who I also featured in my recent cover story). Their most recent episode of the show—covering the final moments of Dark Souls 2—ended on a note of disappointment, so I wanted to see how this new update could fix their few problems with the core game. Souls loremaster VaatiVidya did his best to sum up Dark Souls II's story, but many lingering questions still remain. Kole Ross: Compared to Dark Souls' tightly coiled world, the world Dark Souls II is a beautiful sprawl. It trades cohesion for variety, giving us diverse areas to conquer with little regard to how they ought to fit together. This is fine. The stages are memorable in their own right. In a similar way, Dark Souls II is content to discard a single overarching narrative in favor of a whole bunch of smaller stories about broad themes like "power", "desire", and "futility." You can appreciate these stories in a very private, abstract, and even emotional way... as long as you are able to resist the urge to make it all fit together. It's not a simple world-building problem. At points, it feels like Dark Souls II is unclear on what it's trying to say. It lacks a measure of intentionality. It's resistant to the tricks we used to understand the first game's events, namely parsing item descriptions and enemy placement. It still works, but it's difficult to express why. I hope that Scholar of the First Sin will set this right. The promise of new NPCs, dialogue, and item descriptions makes me hope that From will use this opportunity to draw the pieces together and tell a stronger story. They don't have to spoon-feed it to us. They can stay mysterious, and I hope they do. All they need to do is put more on the page, give the community more concrete lore bits to chew on, and hold true to the themes they built Drangleic around. The world's sprawl works in Dark Souls II's favor. It's a game that's staggering in scope. It's a game that keeps on giving. From has a second chance to make a stronger case for why this story is worth telling. I hope Scholar of the First Sin puts a bow on this wonderful game and establishes stronger links between the individual pieces we already have at our disposal. My best read is that Dark Souls II is about seeking. We are told to seek misery, to seek the true Dark, to seek fire, to seek power, to seek the throne. Scholar's mantra should be "Seek understanding." So the world might be mended. Umbasa. 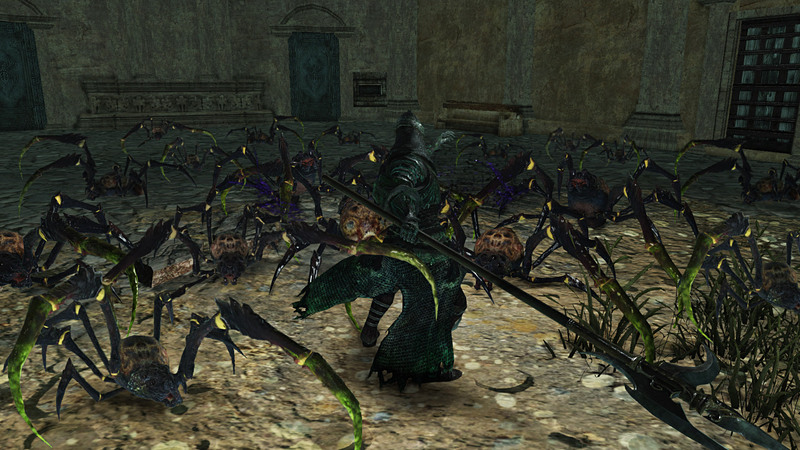 Dark Souls II is upping its spider game, due to popular(?) demand. Gary Butterfield: Dark Souls 2, despite being one of my favorite games of 2014, functions best as a series of short stories rather than a cohesive unit. Each spoke from the hub world tells an evocative and memorable story about a kingdom dealing with the threat of the undead curse. Each DLC tells the story of a different Daughter of Manus impacting or interacting with a wildly different culture. On a set piece to set piece, detail to detail level, the game works wonderfully. While the individual bits work and the overall theming is sound, Dark Souls 2 doesn't tell as satisfying a story as its predecessor. Rather than give us definitive answers and leave us to figure out which questions to ask, Dark Souls 2 leaves so many details inconclusive, mistaking vagueness for mystery, that it becomes hard to square the circle completely. The most obvious way to do this, in my mind, is to overhaul the item descriptions and item/enemy placement. Make item descriptions relevant to the game world and the mysteries at foot rather than riddled with one-off references to faraway lands and long dead heroes. And if an item or enemy shows up in an area, it shouldn't feel random. It's a storytelling opportunity. If we know something about the area and we know something definitive about the item or enemy, we can put on our sleuthing hats and get to work. What I want from Scholar of the First Sin is connective tissue. Toss out the contradictory lore and oblique nods to unreliable history and give me dots to connect. Dark Souls made me feel like an archaeologist. I hope Scholar of the First Sin gives me a taste of that. Out of all the upcoming changes, the increase co-op partners will be the trickiest for FromSoftware to pull off. While their focus on making multiplayer easier than ever is definitely appreciated—I'd pay a monthly subscription if they set up a central server to fix the broken online play of the previous game—I have to wonder how easy it'll be for a team of six to completely steamroll their way through Drangleic; unless, of course, these expanded multiplayer options are only available in specific areas. Whatever happens, though, From has more than proven their trustworthiness at this point, and, given on their design philosophy, their changes and updates are rarely frivolous. And, personally speaking, I'm just happy Scholar of the First Sin will give me more chances to write about this great game well in 2015. FromSoftware proved themselves to the world over the last console generation, and this one looks even better for the formerly obscure developer. Tagged with Dark Souls,	dark souls ii,	fromsoftware,	Previews,	Scholar of the First Sin,	Xbox One. From Software raises the standard for next-gen re-releases with a thoughtful remix of their critically acclaimed 2014 RPG.